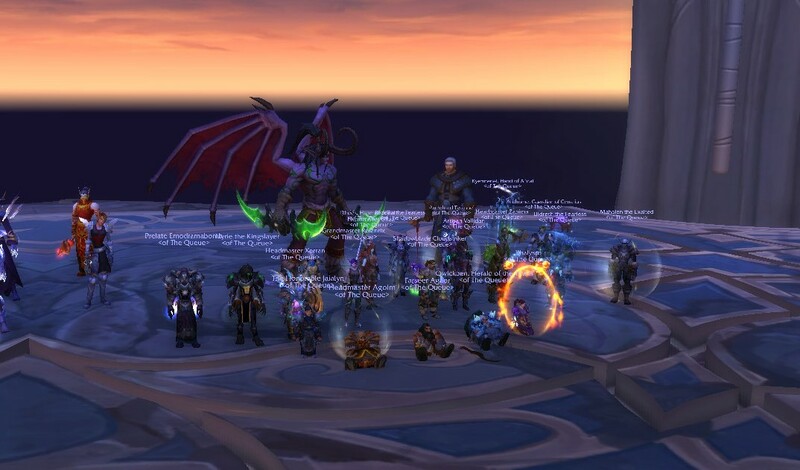 Our first Normal Gul’dan kill! Last Wednesday, I ended an almost 2 month long hiatus and entered my first raid. While it certainly wasn’t the triumphant return I had hoped for, I am glad that I chose to jump back in. Nearing the end of November and beginning of December, I made the difficult decision to stop raiding. Anyone who’s read this blog or knows me in Azeroth has probably figured out that raiding is my favorite WoW activity. I like dungeons and I like transmog, but I really love raiding. But back two months ago, my most favorite activity was rapidly become my least favorite and so I decided it was best to (potentially permanently) step away. The first reason for this came down to something as simple as timing. I was just so gosh darn busy that I could only make it to a handful of raids. In some situations, this might not have been the end of the world but in this case, I found that I was actively gimping the team. We were progressing through Heroic, maybe looking into venturing into Mythic, and I was one of the core healers. Me being gone or late every other night was severely impacting progression. So as much as I might have loved raiding with the team, the reality was, I was bad for the team. The second reason was a lot more personal. I’m not going to go into the details for the sake of those involved, but I did not feel welcome at raid. Beginning even before my attendance started dropping off (so the issue wasn’t created by it), I truly felt as if some members of the team, mainly one person, just did not want me around. I made a few attempts to talk to the person but it wasn’t getting anywhere. Slowly but surely, the sense of vague animosity changed raiding from something I loved into something I dreaded. So once my attendance got spotty, it was a lot simpler to say goodbye to raiding because the experience was already soured. So there I was. Maining a holy paladin and yet, not healing a thing. As my hiatus dragged on, I found myself playing less and less Warcraft. Not because of lack of time, but rather due to lack of interest. And what’s worse, the friends I had made on my former raid team began to drift away. I was still in the guild and still relatively active but because I wasn’t raiding anymore, I was no longer people’s first choice to talk to. To be clear, I was never ignored or shunted. I doubt anyone did it purposefully; it’s just when you don’t hang out with someone on a bi-weekly occasion anymore, they can slip out of sight, out of mind. I don’t blame anyone one bit, but I was feeling incredibly lonely. This dragged on and on. It got to the point where I was logging in maybe twice a week, and only for a few hours at most. Eventually, I sat back and took a good long look at the way things were. Evaluated the problem and evaluated my part in it. My schedule had pretty much cleared out at this point, so the only thing keeping me from re-engaging with my guild was my own reservations. And instead of tackling the issue head on, I had decided to run away from it. I decided then and there that enough was enough. I loved raiding, it was my thing! And taking a break from it, while it had been necessary at the time, was not something I needed to do permanently. And there was never a better time than right now to jump back in. I started logging in again, gearing back up. There was most undoubtedly a few bumps in the road but eventually I mustered the courage to approach the raid leader about the issue head on. And then, I was back on the team, just in time for Nighthold. The animosity from before was still there, but the guilt about bringing my team down was gone. I had checked my schedule and found it surprisingly clear for months to come, meaning that attendance would not be an issue. What’s more, my healing was better than it had ever been. And, the majority of the team was super friendly in welcoming me back. Still, I needed to talk to the person. I delayed it for a few nights, thinking that maybe I was just being irrational and I should let it go. But as one of my friends astutely pointed out, if it bothers me, it’s a legitimate problem. And if it’s a legitimate problem, it’s going to need to be addressed. Finally, I sat down and had the talk that had been months in the coming. I’m not sure how it impacted them (I hope positively as well) but I know it really, really helped me. By no means is everything solved but I’ve taken a step in the right direction. After nearly three months, I’m finally back home. I had no idea how much of an impact raiding had on my life. It’s kind of a silly thing to admit, “yeah, playing World of Warcraft every Wednesday and Saturday really helps me get through the week, y’know?”. But it is honestly, so very true. Raiding is my zen place. Never do I feel more relaxed, more engaged, and more focused than when I am raiding. I truly do look forward to that two hour block at the end of the night. And what’s more, I absolutely love my raid team. I’ve come to realize that they are my family. We may not always agree but at the end of the day, we’re all in it for each other. And I’ll be all in it for them.